L’Eclisse (Eclipse, 1962) was Michelangelo Antonioni’s final installment of what is sometimes said to be his trilogy of alienation, which included L’ Avventura (The Adventure, 1960) and La Notte (The Night, 1961). Rather than alienation, though, one might find the common theme to be a pessimistic meditation on the possibility of romantic love in our modern civilization. And with each film in the trilogy, the scope of hopelessness seems progressively more gloomy. L’Avventura examined the ephemerality and inconstancy of love. La Notte looked at how the inevitable breakdown of the romantic narrative makes long-term love in marriage unsustainable. L’Eclisse finally closes the theme with a discouraging look at how difficult it is to begin an authentic loving relationship in the modern age. In each of the three films, Antonioni defied narrative film conventions by dispensing with a typical story and focussing on the inner turmoil of the principal characters. And in each film the narrative resolution of the relationship conflicts is highly ambiguous – there is no denouement to speak of. But perhaps of the three films, L’Eclisse is the most uncompromising with respect to narrative development. The other two films have some external events that, temporarily at least, seem to drive the action. But L’Eclisse zeroes in on the possibilities, or impossibilities, of love without much stimulus from external events at all. It seems to be a morose reflection on a relationship that has no hope of really coming to fruition. As such the film is alternatively admired or loathed by audiences, depending on their sensitivities to Antonioni’s aesthetics. The narrative can be structured into about seven sections, though the last three sections are relatively continuous and one could partition them somewhat differently. The overall pace of the film through this narrative is very leisurely, and the principal relationship thread, that between Vittoria and Piero, doesn’t begin until more than halfway through the film. As with L’Avventura and La Note, L’Eclisse opens with a focus on a character who initiates and seeds the principal issue and then disappears from the res t of the story. In this case that character is Riccardo, the fiancé of Vittoria (Monica Vitti), who is in the process of breaking up with him. Riccardo is a handsome, educated, wealthy, and civilized man who is distraught that Vittoria wants to end their engagement. Almost deadened with a sense of loss, Riccardo appeals to her that he always “wanted to make her happy”. But in the all-night “argument” into which the film initially breaks in on, Vittoria gently, but adamantly, swears that she no longer loves him and has to move on. This opening sequence establishes Vittoria as the romantic seeker who is looking for something ultimately fulfilling out of a romantic relationship. Vittoria goes to visit her mother, who is at the stock exchange in Rome and engaged in trading. The market is in the middle of a financial surge, and the hectic trading of the brokers on the exchange floor is an effective metaphorical showcase for what Antonioni presumably perceives as a root cause of romantic alienation: modernism and its economic corollary, capitalism. 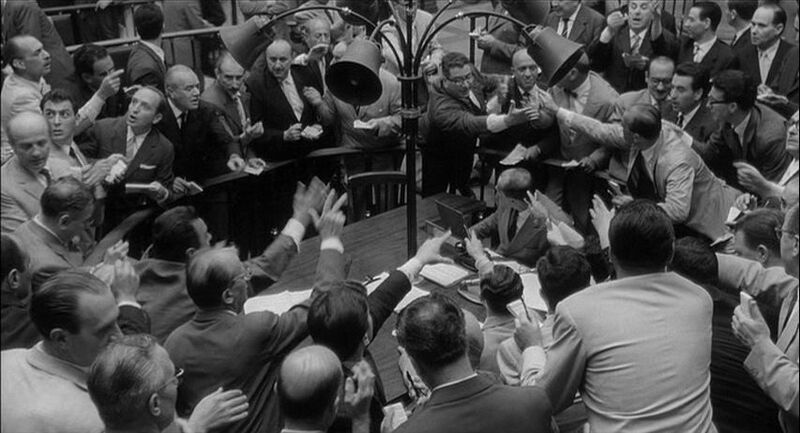 Later in the film, Vittori a will remark, when asked what she thinks of the stock market, “I still can’t figure out if it’s an office, a market, or a boxing ring.” To highlight the frenetic trading madness, Antonioni portrays the stock exchange traders collectively halting and observing a minute of silence for a recently deceased stockbroker – and the film actually does hold on this moment for a full minute of screen time. The second afterwards, though, the floor erupts again in a frenzy of shouted stock bidding and offering. The tonal and temporal contrast between contemplative, meaningful personal (i.e. authentic) interactions and hurried, distracted inauthentic interactions driven by common culture is something that will pervade the film. Vittoria returns to her apartment, and later in the evening a married friend, Anita, shows up. Vittoria, commenting on her breakup with Riccardo, says, “there are times when holding a needle and thread, or a book, . . . or a man – it’s all the same.” They visit another girlfriend recently returned from Kenya, Marta, and the three women engage in girl talk. Fascinated with African exoticism, Vittoria has fun role-playing as an African tribal dancer in front o f her friends. But there is also a sense of emptiness in these encounters, a feeling that is effectively enhanced by a shot of Vittoria walking back to her apartment and being distracted by the wind-driven rattling of flag-pole ropes along her walk. Later, Vittoria takes a ride in a small plane with Anita and her husband. Then she walks about the airfield and stops for a drink at an airport bistro. Vittoria is relaxed and observant of all the new sites and sounds. 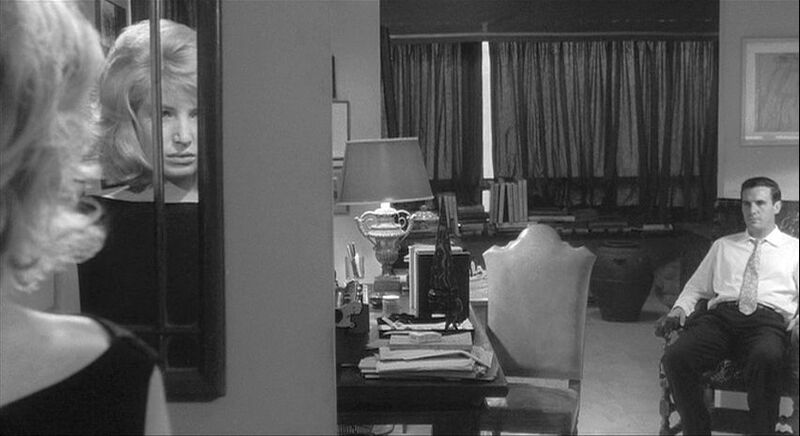 This reflects a recurrent theme of Antonioni’s: the principal woman is highly observant of the contextual world around her, in contrast with the principal man, who is driven by his own internal plans and narratives, irrespective of his surroundings. It seems to be suggested that these plans and structured personal narratives are cutting us off from connectivity with our natural surroundings, including the people around us. 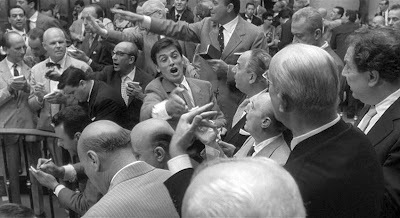 The story returns to the stock exchange, and the focalization is on Piero, a young stockbroker already seen in the first stock exchange sequence. The market is now in a panic, and the stockbrokers are even more hectic in their struggle to avoid catastrophic losses for their investors. But it is the investors who are taking the risks, not so much the stockbrokers. Vittoria shows up looking for her mother, who is in the process of losing 10 million lire (roughly US$ 16,000 in 1962 and over $ 100,000 now) on the day. Vittoria learns of an older man who has just personally lost 50 million lire, and out of concern for him, she follows him out of the exchange and into a piazza. At 67 minutes into the film, Vittoria finally meets up with the stockbroker Piero, who will become her new love interest in the story. Piero accompanies Vittoria out of the stock exchange, looking for Vittoria’s mother, whose apartment they visit. Piero tries to kiss Vittoria, but she turns away. Back at his stock exchange office, where Piero has a junior position as a trader, he is seen to be cocky and arrogant – scornfully dismissing and shooing out of his office personal clients who have just lost their life savings in the crash. Piero then goes out on a date with a pretty brunette, whom he abuses with cocksure arrogance. Piero drives over to Vittoria’s apartment and from the street entreats her at her window to let him come up. With Piero standing outside on the sidewalk, a passing drunk steals his car. The next day Vittoria comes to see Piero’s car being dredged up from the river, where it had crashed the night before, killing the drunk. Vit toria is troubled about the death, but Piero is crassly only concerned about scratches on his car. Then they begin walking down the street and flirting. When they near a street corner, Piero asserts, “when we get there, I’m going to kiss you.” They kiss, but when Piero presses his affections, Vittoria demurs. Back at their respective apartments, Vittoria uncertainly calls Piero’s number, but when she hesitates to speak, Piero impatiently yells into the phone and hangs up. Their romance develops over the next few days as they engage in more embraces in the park and on a couch in Piero’s office. Vittoria is coquettish and encouraging, but at the same time tentative: at one point Vittoria says to Piero, “I wish I didn’t love you . . . Or that I loved you much more.” They agree to meet that night at 8pm at the “usual place” – the street corner where they had their first kiss. Vittoria leaves the office and goes out onto the street. This is the last we see of Vittoria and Piero in the film. 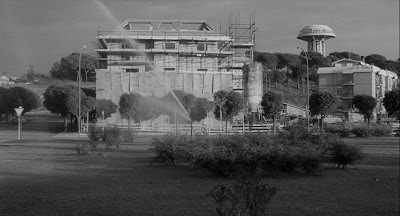 The much commented-upon ending to L’Eclisse is something of a coda or epilogue to the work. This section comprises image sequences without dialogue of all the familiar street locations that were important to the evolving relationship of Vittoria and Piero, but without those two principal characters. Occasionally a person is seen from behind who superficially looks like Piero or Vittoria, but who turns out on inspection not to be. As the sequences unwind, time passes: afternoon passes to twilight, and finally to night, as the streets become empty. We see the street corner of their appointed date, but neither Vittoria nor Piero appears. Either those two characters have lost interest in each other, or the film has lost interest in them and pulled back from their focus. Now we see people on the street holding newspapers with headlines about the “nuclear arms race” – issues of global concern but beyond the local horizons of most meaningful interactive contexts. The images finally become more abstract and inhuman at the close, with the final shot focussing on a glaring street light near the corner of the missed appointment. Although L’Eclisse was perhaps Antonioni’s most uncompromising (to popular film conventions) work, by this time his prestige was so great that the film was nominated for the Cannes Film Festival Palm D’Or. What makes the film interesting is the mood it creates of absence and loneliness. This is highlighted in the last sequence (the “Coda”). The absence of the main characters dominates our perception of that sequence. They are missed, and the activities on the street, without them, seem to be empty and without vitality or meaning. This is the “eclipse”, the original meaning of which term stems from “fail to appear”. Antonioni seems to be morosely suggesting that modern culture has led to an eclipse of the possibilities of love and meaningful interaction. At one point Piero tells the sceptical Vittoria that the financial activities of the stock market get to be a passion once you get to know it. But Vittoria says, “a passions for what, Piero?” To her, as presumably to Antonioni, it is meaningless. Related to this eclipse of meaningfulness is the decontextualizing of narrative, in general, a subject that I discussed in connection with La Notte. Like Lidia, in La Notte, Vittoria here is always open to new events and appearances that come into view. She is open to the vitality of the external world. But, like Lidia, she lacks a meaningful narrative in this world. The ones offered to her by Riccardo and Piero are ultimately empty to her; they are not really what she is looking for. Throughout the film, Vittoria lapses into artificial play-acting – both with her girlfriends and with Piero. The play-acting is so forced and unnatural that I originally attributed it simply to poor acting on the part of Monica Vitti. But on reflection, it seems to me that this artificiality in her role-playing is what Antonioni wanted to portray. She is trying out roles, such as being a native African dancer with Marta or being a coquette with Piero, but this role-playing lacks substance or meaning – they are not sustainable in a longer narrative that would satisfy her. Thus she found her role with Riccardo was empty and directionless, and any meaningful role in a narrative with Piero would presumably be hopeless, too. Piero is comfortable in his little roles defined by modernist society, but they are shallow. Although he is generally friendly and not devious, Piero is narcissistic (he is unconcerned about the death of the drunk), arrogant (he abusively breaks up with his old girlfriend), and superficial (mostly concerned about his car). When Vittoria discovers a vulgar pen in his office, she begins to realize that, despite his handsome features, Piero offers no long-term romantic happiness for her. So with L’Eclisse Antonioni has delivered his most depressing portrayal of the possibilities of romantic love in our modernist, alienating, and dualistic world. The problematic focus has moved from fickleness (L’Avventura), to unsustainability (La Notte), to here in L’Eclisse the seeming impossibility of true love in the first place. But let us not be too pessimistic. Love is not a complete mirage, a fata morgana. We, like Vittoria and Antonioni, sense that it is real, and we must keep looking. It is both out there and within. Thank you for the in-depth analysis. You know how to read images and signs.